I am alone. A cocoon envelopes me; a grey nimbus of fatigue, torpor and pain. The icy December wind sweeps in from the north-east and howls along the mountain like a hurricane. It slices into you like a surgeon’s knife, cutting to the very bone, laying you bare against the mountainside. I draw long, shuddering breaths; no amount of air that I pull into my lungs seems to suffice. The altimeter in my watch reads 18,300 feet, the baro pressure at 54 hPa. At these pressures, the atmosphere is so thin that the oxygen levels have dropped to almost 50% of that at sea-level. My muscles are screaming at me now. I look up for the umpteenth time. The summit of Kala Pattar is etched stark against an azure sky. It looks deceptively close, but then it’s looked this way for almost three hours – ever since I started up this black, boulder strewn mound at 5 am. In our lives, we all experience some defining moments that become embedded in memory, in the inner recesses of the self, for all time. I turn and there it is spread out before me: a panorama often described as one of the most astonishing views on earth. Dead ahead is a gigantic massif of rock and ice. The immense wall of this colossus is riven everywhere into a million folds like the flesh of some pre-historic creature; then it all coalesces into a triangle at the apex where the summit of Nuptse lances the sky at 25,850 feet. To its left a sweeping curve of ice rather like a ski slope ends in a mass of tumbled blocks at the foot of the massif. This is the famous Western Cwm that ends in the Khumbu Icefall. Such is the scale of the vision that unfolds before us that boulders of ice hundreds of feet high appear like children’s playing blocks. But it is to a black triangle behind the two frontal peaks to which my eyes are inexorably drawn. It sits quietly, a backbencher that wishes to draw no attention. The wind chill is intense, but I feel no fatigue, no pain. Instead I am suffused by an almost religious sense of awe. 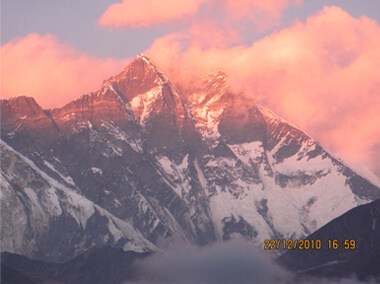 For this is Chomolungma, or ‘saint-mother’ to the Tibetans, Sagarmatha to the Nepalis and Everest to much of the world; at 29,038 feet the highest formation on the surface of the planet. For close to two centuries since its emergence as a unified country in the late 17th century, Nepal remained closed to outsiders―a land of extraordinary myth and mystery. All foreigners were forbidden in the country beyond the Terai, a swamp country well to the south of the Great Himalaya. British surveyors who were busy mapping the Indian subcontinent in the 19th century had perforce to set up their measuring instruments in the Terai―to map the snowy ranges to the north as best they could from a distance of 150 miles. In 1865, in a contentious meeting of the Royal Geographical Society in London, Peak XV stamped itself clearly on general public consciousness when it was decided to name it Mount Everest (after George Everest, the Surveyor-General who completed the Great Arc of India). But it remained as remote as ever: a distant spire of mystery deep in a hidden land. This is not the time and place to recount the high drama of early attempts to tackle the mountain. Suffice it to say that by now Everest had fired up the imagination of the mountaineering fraternity the world over. The reconnaissance expedition of 1921, ‘walked off the map’ with George Mallory actually getting onto the North Col of Everest and establishing that it did offer a route to the summit. The 1922 and 1924 expeditions saw triumph and tragedy; triumph that human beings crossed a height of 28,000 feet for the first time, tragedy that these attempts cost several lives. The most famous casualties were those of Mallory and Sandy Irvine, who disappeared during their summit push on 8th June, 1924, leaving behind a sort of ‘whodunit’ of mountaineering (their bodies were found several decades later). Other assaults were made on Everest during the 1930s. One was by ‘the mad Yorkshireman’ Maurice Wilson who, incredibly, decided to fly to India in his second-hand Tiger Moth, crash land his plan on the lower slopes of Everest, and make a solo push for the summit. Climbers even today come across Wilson’s remains which crop up with a bizarre regularity upon the Rongbuk Glacier. Despite several serious attempts that came tantalizingly close to the summit, the mountain held out against all comers, time and again defeating them with its weather, altitude and terrain. The Chinese occupation of Tibet in 1951 suddenly sealed off the mountain, but as one door shut another opened with Nepal unexpectedly permitting an approach to Everest―the first from the south side. Eric Shipton – the pre-eminent Himalayan mountaineer of his day – led the recon expedition. It was a path-breaking effort. 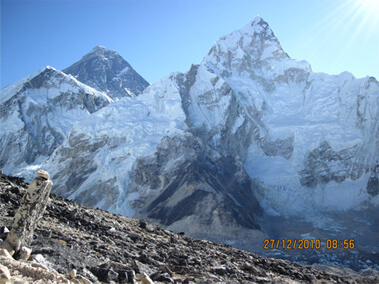 For the first time the menacing Khumbu Icefall was breached and the Western Cwm attained. A more controversial product of the expedition was what appeared to be definitive photographs of footprints of the yeti―the ‘abominable snowman’ of legend. Basing their approach on the immense amount of data gathered by Shipton’s team, the Swiss made two heroic attempts to gain the summit in 1952. In their team was a Sherpa of quite exceptional courage and ability. His name was Tenzing Norgay. Lambert and Tenzing made it to a height of 28,210 feet – higher than anyone had climbed before – but were forced to turn back by lack of oxygen and exhaustion. 1953 then was a crucial year. It was the turn of the British to take a stab at the mountain and the pressure on them was enormous. The Swiss had almost succeeded and it was clear the mountain would be climbed―and soon. Everest was already given to the French in 1954 and again to the Swiss in 1955. This brought in an element of ruthlessness into the calculus of deciding who would head the expedition. Shipton was dropped in favour of Colonel John Hunt, a ‘thruster’ who brought military-style siege tactics to the problem of Everest. 29th May, 1953 saw two men camped on a narrow ledge at 27,900 feet on the slope leading to the South Summit of Everest. “At 4 am it was very still. I opened the tent door and looked far out across the dark and sleeping valleys of Nepal. The icy peaks below us were glowing in the early morning light…” So wrote Edmund Hillary as he and Tenzing Norgay started up to the top. After seven hours of a draining, never-ending climb over some very tricky ground, they reached the top at 11:30 am. The pinnacle of the world had at last been attained. The lines of Everest are etched clear and sharp, the mountain seemingly close enough to reach out and touch. I take a shuffling step and fling my arms wide and suddenly it is not just Sagarmatha, but the soaring peaks everywhere around me: the perfect equilateral of Pumori to my left, Lingtren, Khumbhutse, and the great spire of Ama Dablam to the south. There is an impossible remoteness and purity to this country of the high Himalaya that sweeps up the spirit with it, and I’m a pilgrim looking upon a promised land. be drawn back from silence towards sound. It is time to get back.